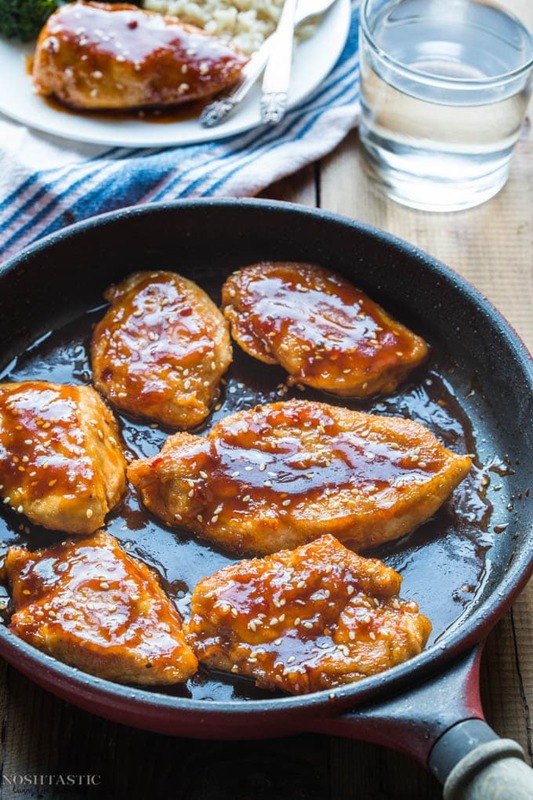 Paleo Honey Sesame Chicken - make it in 15 MINS! 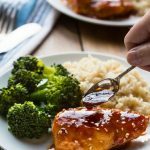 Quick, easy, and healthy, this easy Paleo Honey Sesame Chicken is a winner and cooks in only ten to fifteen minutes! I’m always on the look out for more easy weeknight dinners that I know my family will love. Thankfully my boys are not super picky and are pretty easy to please. 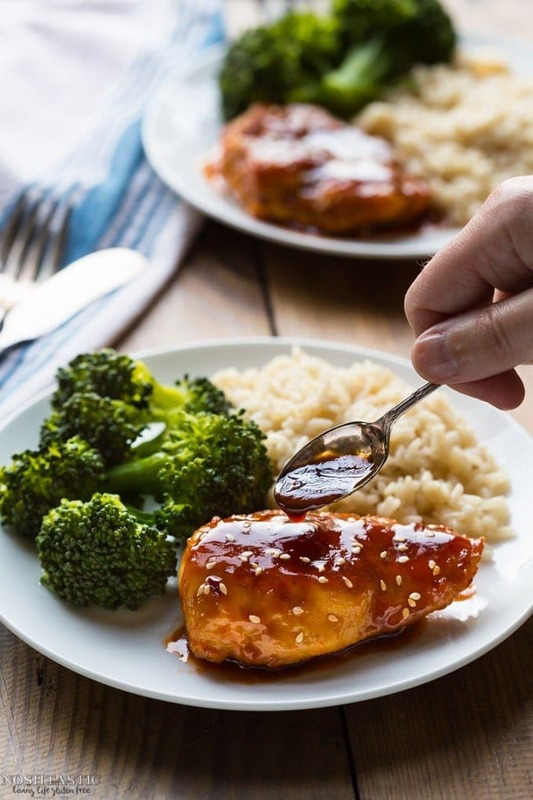 I saw this recipe last week when I was searching round the internet for dinner inspiration and knew right away that it would be a crowd pleaser so I tweaked it a little to make a paleo honey Sesame Chicken recipe that would be safe for us to eat. I sometimes adjust down cayenne pepper or red pepper flakes if I find them in a recipe as my kids will sniff that stuff out at 50 paces and probably not eat whatever it is I’ve prepared. The 1/4 tsp in this recipe adds very little heat and this time they didn’t even notice. If you prefer a little more heat then, by all means, add more chili flakes! MORE EASY WEEKNIGHT DINNER RECIPES! For non - Paleo (with soy sauce and cornstarch) cooking instructions, please read the notes! Toast the sesame seeds in a dry pan over a medium heat. It will take about three minutes. You will need to stir them all the time so they don't burn and toast evenly, toss them out onto a plate once they are done. Mix honey, coconut aminos, tomato sauce, sesame oil, garlic, and red pepper flakes together in a bowl, and mix in the arrowroot. If you haven't already done so, cut your chicken breasts in half lengthways, so that you get a thin fillet. Season the chicken pieces with a little salt and pepper on each side. Heat the oil in a large cast iron skillet over medium-high heat and then add the chicken pieces. Do not crowd the pan and just do a few at a time. it will take about four minutes per side, eight minutes total. 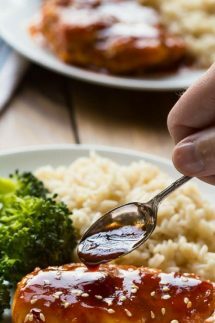 Add the honey and coconut aminos mixture to the pan with the chicken pieces and stir well, cook for a minute or so and then turn the chicken pieces so they get coated in the sauce and cook for a further minute or two. Check that your chicken is cooked through, then remove from the heat. Sprinkle with sesame seeds and serve hot over zoodles for paleo, or rice if you are not following paleo. NON PALEO VERSION - for the regular gluten free version you can substitute GF soy sauce for coconut aminos, ketchup for the tomato sauce, and cornstarch for arrowroot. You can also season the chicken and then dredge it in cornstarch (shake of the excess) and then pan fry it as per the directions, and the sauce will thicken in the pan along with the chicken as it cooks. This does not work as well with arrowroot and tends to result in somewhat slimy chicken, so it's better to skip this step and simply add the arrowroot to the sauce directly. I just made this and oh. My. Goodness! So easy and so delicious! I did the Paleo option and didn’t realize until I took the first bite that I forgot the add the tomato paste. Oh well! It doesn’t need it anyway! just made this in the gluten free version. It is awesome!!!! Loved it. And so quick and easy. Hi Marylin, so gald you liked it! it’s so easy to make! Made this dish for dinner tonight as I had everything on hand. It was amazing!! Full of flavor and easy to make. Will be making this again. Thank you! Hi Lacy, thank you for your kind comment and I’m delighted that you enjoyed it! It was delicious!! Thank you so much for the recipe! I am newly diagnosed and struggling to make this lifestyle change. I am grateful for your blog! Hi Barbara, thank you for your kind comment and I’m so glad you loved the recipe! I know how hard it is to adjust to a new diagnosis like this and all that it entails, it can be quite overwhelming. Please feel free to email me if I can help you with anything at all related to your diagnosis, my email is in the contact tab at the top of the website. Seriously great chicken recipe! The sauce is addicting and everyone kept commenting on how good it is. Really good as leftovers and on salads! Thanks! Found this on Pinterest tonight. Wow!! It was so tasty and so easy! I had to sub a couple of ingredients (olive oil for sesame oil and skipped the sesame seeds because ours didn’t look fresh). Total hit! This will now be on our regular meal rotation. Thanks for sharing!! I just made this dish. I was so excite because it smelled SOOOOOOO good and I was not disappointed. I too had to change the sesame oil for olive oil in honey mixture but it was still delicious. I ended up cutting my chicken into bite-sized pieces for quicker cooking time. Great recipe, thank you. This is so easy and delish.. I actually made it without the sesame seeds. Thank you!